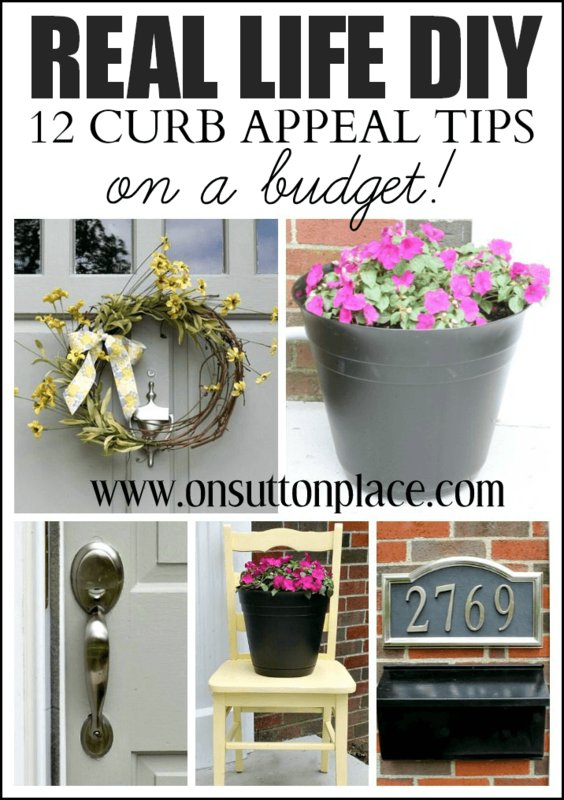 12 DIY Curb Appeal Tips – on a Budget! A few years ago my daughter, Elizabeth, bought her first house. It’s a little bungalow that had been completely updated on the inside…but not on the outside. The first year she kept up with basic outdoor maintenance but the real work had to wait. Over the past few weeks we have worked hard on the weekends to add some much-needed curb appeal to her house. 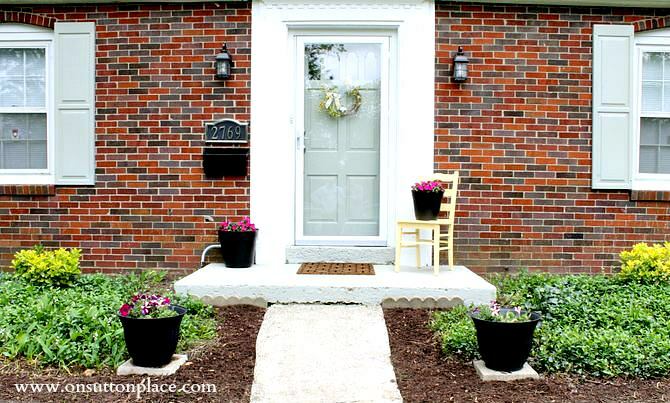 We’d like to share our 12 DIY Curb Appeal Tips…and we did them all on a budget! So you can see what we had to work with here is her house a few weeks ago. It had good bones so we started there. 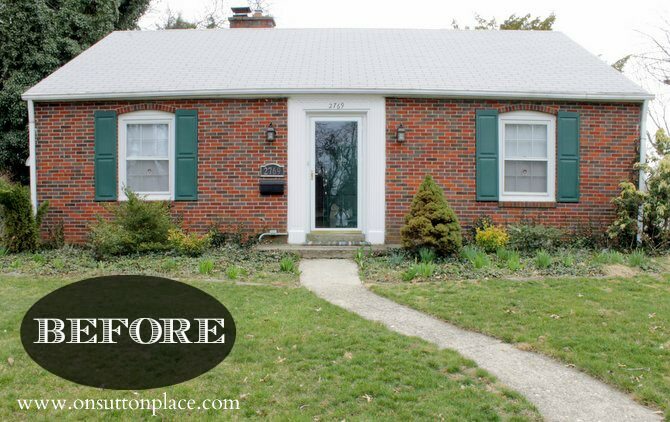 The brick is in great shape for a house this age but the porch stoop needed work. We thought about replacing the front door and storm door but opted to update the existing doors with paint. We made the decision for budget reasons but in the end we are so glad we did. We kept the original door and it looked like new after a fresh paint job. I made a plan so we could address one thing at a time. Looking at the big picture when we started was a little overwhelming. The first thing we did was prime and paint the front door and shutters. Next we painted the front stoop. We used concrete sealer and then 2 coats of concrete paint. While Elizabeth was painting (yes…she really climbed the ladder and did it herself…) I went to work on the landscaping. I edged, pulled the ivy along the foundation and just basically cleaned up. One of the easiest ways to update your landscaping is to remove old or dead bushes. We cut down 6 along the front of the house. They were all dead or dying and needed to go. We opted not to dig them out because of the labor and time involved. We used a pruning saw and cut them all off at the root. The existing ground cover disguised the stumps so they didn’t show. At this point we washed the gutters and the windows. I can’t tell you what a difference that made. It took us about an hour but the pay off was huge. Finally…it was time for the fun stuff! We bought 10 bags of mulch and laid it around the ground cover. We used inexpensive black planters and filled them with colorful annuals. 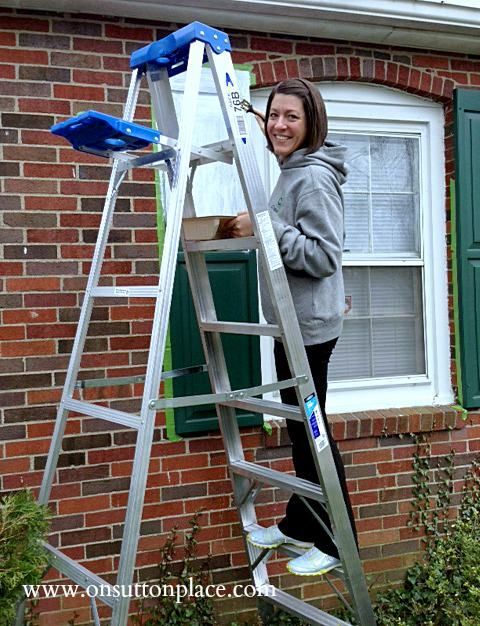 Shortly after she moved in, Elizabeth replaced broken porch lights, an old mailbox and outdated house numbers. I gave the mailbox a fresh coat of black paint to clean it up. She also replaced very rickity hardware on the front door. The hardware on the storm door was gold and we spray painted it metallic silver. We spray painted an old chair a soft yellow and added a little wreath to her door. 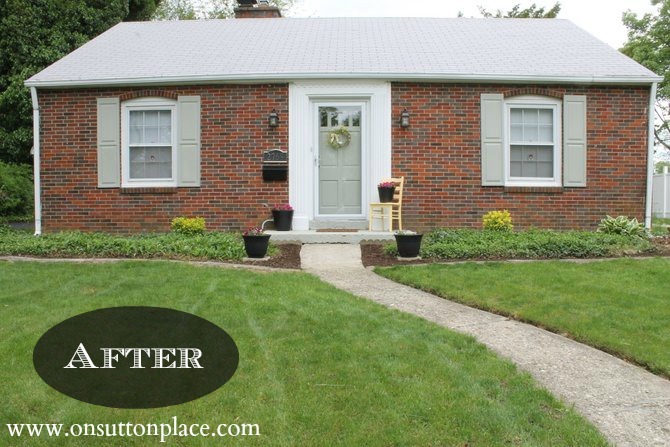 A new mat on the porch was the finishing touch to this makeover. One thing that I was determined to do when we started was to somehow hide the ugly electrical outlet beside her front porch. We knew removing it wasn’t an option so we placed a large planter in front of it. Problem solved. 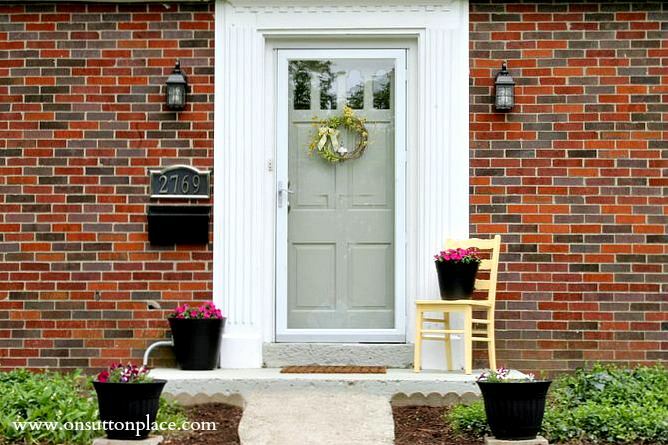 So…to sum things up: Here are 12 easy, DIY things you can do to add curb appeal! Click here to see more of Elizabeth’s House. During 2 of the work weekends we had the best little helper. 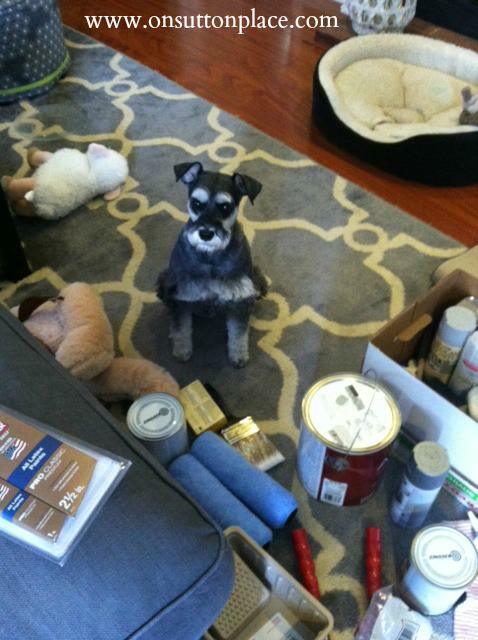 Here’s Kelly looking puzzled by the mess we made with our painting supplies. Not sure we could have done it without her! Hi there! Your daughter’s house is adorable. My husband and I actually just purchased a brick front house in December. Do you remember the name of the gray paint you used on the outside? Fantastic job! It’s really an adorable home! And just an idea…we have pipes coming from our basement and out into our yard, we spray painted them, you could do the same thing with your electrical outlet to hide it. Made a big difference here! You and your daughter did a great job on her house (how old is it , by the way). I love little bungalows like that. The new door and shutter colour is perfect and really updates the house. 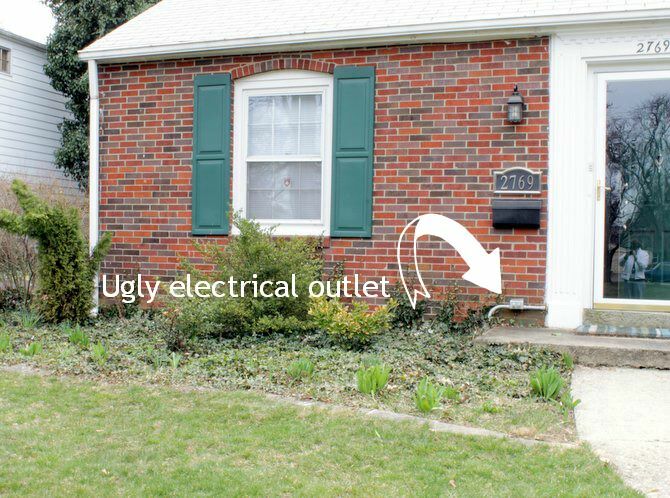 Personally I would paint that little electric outlet a red to match the brick as it is going to show in the winter when you take the planter down. Beautiful! Changing the door and shutters color made a huge difference! Looks great. What did you do to the grass? I have the same patchy grass as the before picture and the after looks sooo much better. I love the updates she made to her home. Landscaping and house color choices are so important in what gives your home it’s curb appeal. I bet she loves driving up to her home now. What a beautiful transformation! Want to come do mine next? ;) I popped over from Tatertots and Jello–thanks for sharing! What an amazing transformation! I really need to add some fun colors to our front porch. Your daughter’s house is very pretty, I looked back to read about them again, I love her sweet home, it’s decorated very nicely. 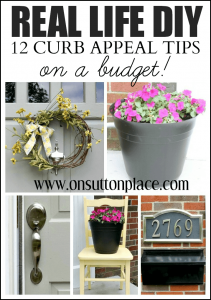 This was an extremely timely post for me to read since I am helping my son with a little curb appeal for his home. His shrubs had me baffled. The pruning saw just may be the answer with a little periwinkle he has here and there. Thanks for the inspiration. You all did a great job, Ann. Really nice. You and your Elizabeth are quite a dynamic duo! Kudos!!! Her house looks great. There is always something like that to contend with. Our current home is relatively new, but even then the previous owner had such strange notions on where to locate light switches around this house! It’s always something. I gotta say, if your daughter stays in the house and wants to make the investment, I new covered portico walk up and front porch on this bungalow would be just beautiful. Looks like one of those great bones homes. Sweet. 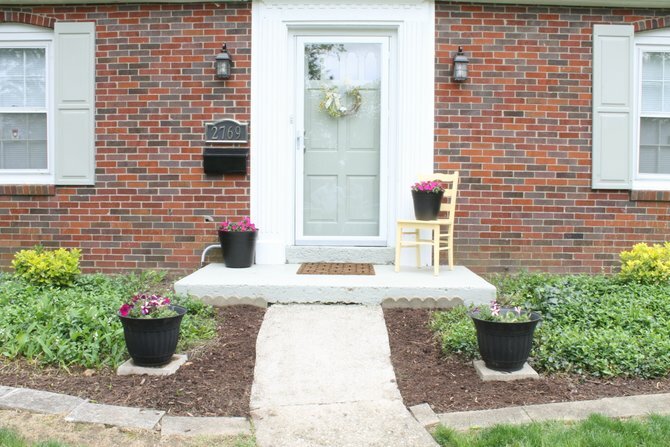 Our home was built in 1958 so some of these tips will come in SO handy when we give our porch and front yard some serious curb appeal! What a difference! It looks wonderful Ann. These are all great easy tips. Makes a huge difference. Thanks for the inspiration! Ann, what a cute little home, I love everything you guys did and it made such a huge impact. That yellow chair is just darling. Love it!! My son just bought his first house and we have been busy cleaning up also! Have hung pictures and art work inside and now need to move to the front porch, loved seeing what you all did! It looks great! You and your daughter did a great job, Ann! Amazing what a little elbow grease will accomplish. Love the color on the door and shutters. I think that made a big difference, as well as painting the step. What a difference it made. I love her house…it has such a charming feel to it. You two did a great job! That is quite a transformation for so little money! What a charming first impression now. Great job! That is a very impressive renovation of the front entrance area. Very simple and straight forward jobs, but what an impact. Which pruning saw did Matt Knowton recommend. I did go to the site but it was not immediately obvious to me. I do not have a blog. It looks great! If she is thinking of adding more bushes she should wait for the fall. A lot of the garden stores discount plants and bushes at that time. She could get more bang for her buck! Yes Colleen we will definitely wait until fall to plant anything. Sure beats watering new plants all summer! You two accomplished such an amazing transformation! There is a dramatic difference between the before and the after. Your daughter must be as proud as can be of her home! And she is so lucky to have you to guide her in her choices. Elizabeth is so blessed to have you near… and vice versa! Her new home is being transformed beautifully!!! LOVE all your tips… especially removing dead shrubs. What a difference that made! Looking forward to all your great recipes at Debbiedoo’s! Beautiful transformation!…Love the new color on the shutters and Elizabeth has done such a great job in turning her house into a beautiful home…It certainly would be so pleasing to walk up to the pretty front porch and front lawn! That is quite the dramatic difference between the before and after. Your work was so worth it. I love the new grey on the shutters and door as it is more contemporary and suits the brick colour. Amazing what lots of hard work and a little cash can do. Elizabeth has a lovely home with great curb appeal now. Really a fantastic job. I love that you kept the costs down, and every project was manageable. The after is so remarkably better! Love the planters and the change of color on the shutters the best. Ann, what a fantastic job you and your daughter did. Even the front lawn looks better. The bungalow is so cute now. And think of the thousand of dollars of value you added to the house for $300 and some grunt work. Job well done. Ann – You and your daughter did a wonderful job. So many little details that really changed the front of her home. Way to go girls!! Your daughter must be so proud! Hey another thing she can do to help hide the electrical outlet even further is paint it to match the brick. Love the post-work picture. So glad the weather cooperated for you. You guys did an awesome job! Such a cute house to work with and I love what you did for curb appeal! You all did a great job sprucing up the outside of your daughter’s house. What a difference paint, landscaping, mulch, and clean windows can make!! Good job! Great job Ann! Love the color choices you all used. What a difference it makes. I am sure she is so proud of her darling new home! Wow! I would say you two did an awesome job not to mention what an accomplishment and how proud she must feel to have it finished. I love these before and afters. Good job, ladies! Fanatic job:) What a pick me up the curb appeal gave the darling house. Wow Ann! It’s amazing what a little paint and some gardening will do to the streetscape of a house! It looks really great and I think you both did an awesome job. Elizabeth’s house is adorable inside and out! Such a charming little house – it deserved a little curb appeal – nicely done! What a wonderful transformation! You ladies did a great job…the beauty is in the details. Your daughter must be so happy. Love it! What a cosy home! Love the transformation. Isn’t it amazing. I wish people everywhere would invest just a little each year and all the neighborhoods would look so much better! What a difference that makes! The person who originally planted those bushes obviously loved their garden. It’s a shame it was allowed to go to ruin. Thanks Andie! Elizabeth actually bought the house from the family of the original owner. He was very old and I think the house was let go for a long time before he died. There is still much to do in the back yard…but that’s a project for this fall! Oh and I can’t wait to see you on Thursday with your something yummy! You two did an outstanding job on the house…looks 100% better. Curb appeal is at the top of my list. Now I need to go check out the inside of her home.